No amount of money is too much for a food or beverage company to spend when food safety is at risk. And that’s exactly what some bad apples are spending these days, as recent evidence and food safety scares indicate. But even in a recession, the price of upgrading your plant is nowhere near the cost of not doing so. – Bob Graham, The Austin Co. If you ignore food safety issues – a leaky roof, standing water, improper separation of raw from finished goods – you’re not just cheap, you may be a criminal. When you knowingly let pathogens roam free, you give the food industry a black eye, and you could end up sharing a bunk bed with someone like Bernie Madoff. Stewart Parnell, CEO of Peanut Corp. of America is not there (yet) but a criminal investigation is under way. In light of that recent national food scare and scandal, it’s stupefying to hear from one architecture, enfgineering and construction (AEC) firm representative that a call just came in from a peanut company seeking a food safety audit. The peanut processor had no formal program to segregate its raw materials from finished product. Regulations or market forces can drive a company to make upgrades. These include ongoing HACCP and international ISO 22000 programs, standards from AIB International (www.aibonline.org), the SQF Institute’s Safe Quality Foods Initiative (www.sqfi.com), or Wal-Mart, which is backing SQF as part of a worldwide effort to force the food industry to meet safety standards. 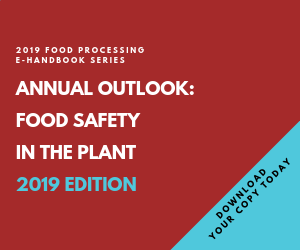 Areas affected by standards and regulations include items that are traditional safety matters, such as pathogen detection and prevention, to measures that related to allergens and even organic processes. One major factor that ties all of these together falls under the category of segregation. Segregating raw from finished goods or ready-to-eat products encompasses how plants design physical storage areas as well as processing, packaging and even process and utility air and water flows. It’s long been a standard to maintain higher pressure in production areas, as seen in meat and poultry clean rooms. Segregating materials that cause allergic reactions such as peanuts, milk/eggs, soy wheat, and fish/shellfish, has become another requirement. Even organic food products require segregation of equipment for organic processing. Solutions can be low-tech or high. For example, one of the easiest and most beneficial food-safety moves is controlling access and traffic through the plant with color-coded stripes or room surfaces. This is a classic way to reduce the likelihood of cross-contamination as employees move from one area of the facility to another. A high-tech version of that includes engineering the flow of personnel to minimize cross-contamination, using computer modeling during the initial stages of facility design, according to Vince DiPofi, senior vice president and head of food and beverage for SSOE Architects + Engineers (www.ssoe.com), Toledo, Ohio. Indications from the AEC community are that all responsible food companies are undergoing audits, largely pressured by Wal-Mart Stores, followed by other large retail and foodservice customers. This affects not only direct suppliers but the contract packers who do business with them, because safety precautions and traceability in the event something goes wrong goes all the way from the retailer to the farm. “What these retailers are saying is that the government isn’t good enough, you’re not good enough and we are going to mandate certain guidelines and inspect your plant,” says Bob Graham, vice president of the food and consumer products group at The Austin Co. (www.theaustin.com), Cleveland. “What this amounts to is that you have to have a suitable program for traceability from the time a raw material enters your plant until it’s shipped to the consumer.” He notes that “almost all the plants out there have some level of compliance” to regulatory and voluntary food safety programs. The latter – “voluntary” food safety programs – may be more perilous to the bottom line, because “Wal-Mart will inspect and tell you, ‘You’re not meeting the guidelines we have for this plant. You have 60 [or] 90 days, and we’ll be back. Or we won’t do business with you anymore,’ ” says Mike Pierce, senior vice president of sales & marketing for Austin.